A beautiful play of colour gemstone that has to be seen to be believed. 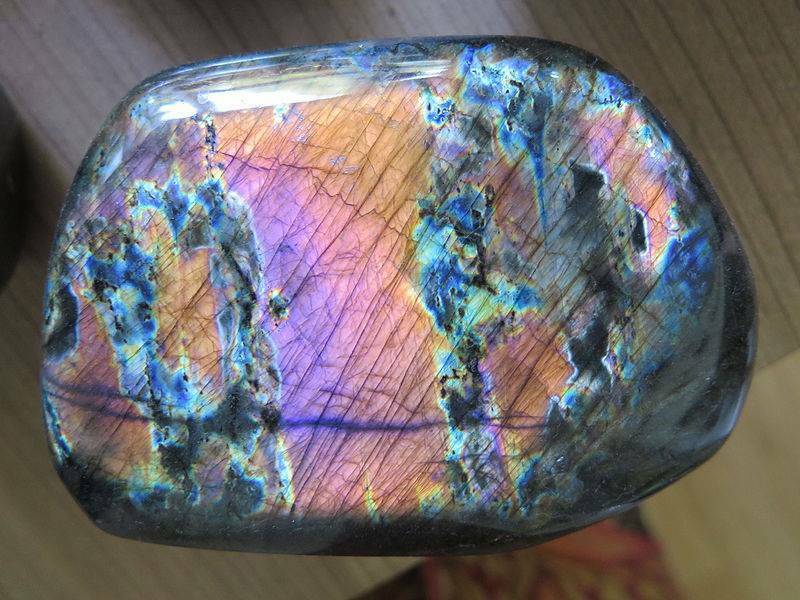 Different angles and different types of light create beautiful coloured patterns on the stones surface. 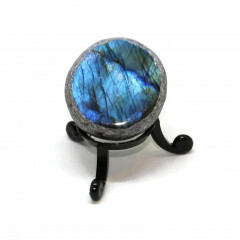 It is almost always sold polished, to show off the play of colour effect of the gemstone. 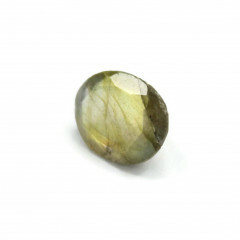 A truly beautiful gemstone, and a member of the Feldspar family, the stone is coveted for its remarkable play of colour, known as labradorescence. Its appearance is so unique that ancient Inuit people believed that it fell from the frozen fires of the Aurora Borealis. 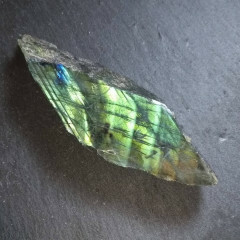 The stone has an iridescent surface that displays flashes of peacock blue and green with grey and gold. It is almost always sold polished. 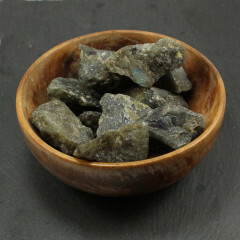 Rough samples are available for low prices, although they do not always exhibit the classic effect – obviously, the better quality pieces are polished to show off the fire! Lapidarists may be interested in the rough samples, of course – or mineral collectors who admire the natural look of a mineral or stone. 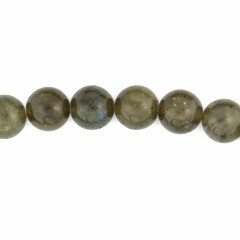 It is a reasonably hard gemstone, and is frequently used for jewellery, especially in the ‘wire wrap’ style. 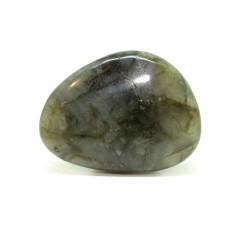 It makes an excellent decorative object, too – we sell a range of polished and carved stones for decoration. It naturally occurs in a few areas worldwide – the most well known is the region of Labrador, Canada. It has also been found in Norway. 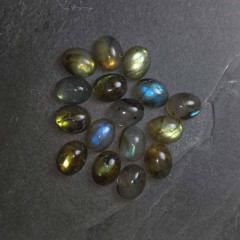 Some gemstone quality pieces are also known as Spectrolite – sellers on auction sites frequently claim this in their titles. Whether it is an attempt to mislead, or a simple misunderstanding, we cannot say. 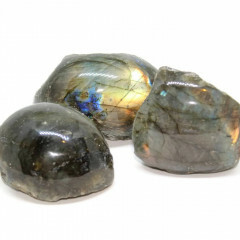 Spirituality and Crystal Healing with Labradorite. 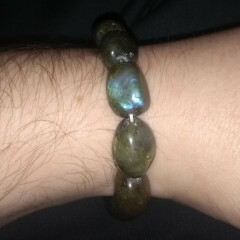 Wearing the stone is said to awaken one’s innate magical senses and enhance mental and intuitive abilities such clairvoyance, telepathy and prophecy. Its energy stimulates the Throat chakra which allows for an easier flow of energy to the other chakras leading to better communication with ourselves and the divine. 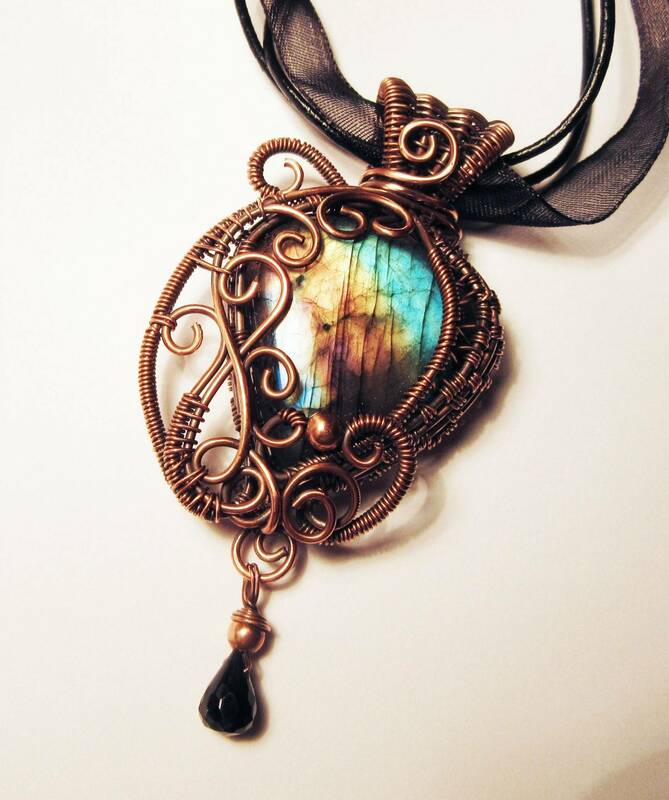 Stunning wire wrapped pendant, made by Poltergeist Jewellery, a local jewellery designer/manufacturer.